As you probably know, the official sounding Commission on Presidential Debates is nothing more than a gang of Democrats and Republicans who, in the mid 80s, grabbed control of presidential "debates" from the League of Women Voters in order to make sure only approved candidates would be able to participate and only in approved ways with approved moderators. For years, the CPD has maintained that only candidates who poll well in select media can be included in the candidate shows. Conveniently, as has been demonstrated pretty clearly with the DNC emails and the current FOX News soap opera, the major media corporations are closely intertwined with the two parties and so (CNN's Green Town Hall notwithstanding) it has been pretty easy for them to provide poor and sometimes misleading coverage of the "lesser" party candidates so that people answering polls often don't know other parties exist. So, we, the citizens who are supposed to be controlling things, are left to beg news corporations and the elites in the Democratic and Republican parties to let us hear from and about people who want to be president. (We are not talking about Pat Paulson here.) And candidates' outreach to voters (except for D. Trump who received about 2 billion dollars worth of free advertising) depends upon the money they raise from the wealthy for the most part. Thankfully, I guess, the internets now provide other ways for people to communicate around the official pipeline. During the primary season, Bernie Sanders (who had called for two party primary debates) successfully inserted himself into the Republican debates using Twitter, for example. 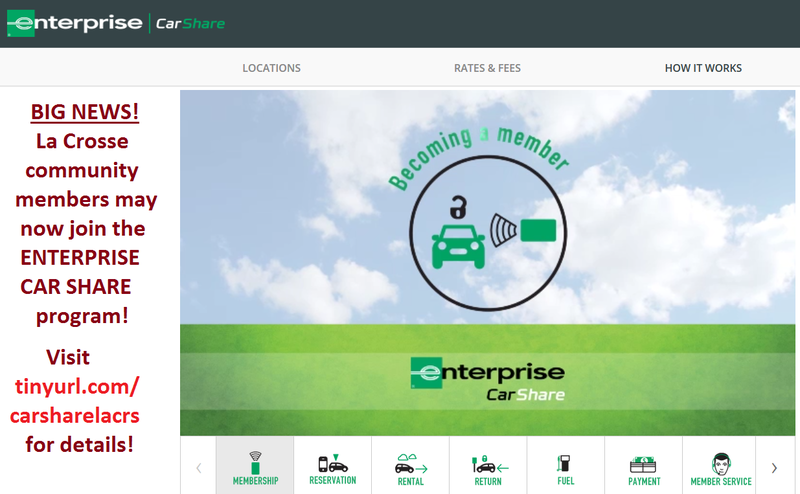 Sign the petition if you think it will do any good. But really, we should not have to beg for this. In the meantime, the Vernon Dems are hosting a Letter to the Editor writing workshop on August 24 and an Our Revolution watch party on August 24. The La Crosse County Dems will hold elections for officers in November. Candidate slates will be released in October and those running for positions on the board must join or be members in good standing by, I think, September. Leadership of a county party can make a big difference. This article, The People of Vermont versus Monsanto and the Feds by Paul Cienfuegos, was recommended by Minnesota activist friends. The conclusions of the Princeton "oligarchy study," that there is really no correlation between what most voters want and what laws are passed (cartoon version here), is perfectly represented by the passage of the DARK act. What human in her/his right mind would NOT want to know what's in the food we buy and eat? What human wants a secret trade court to decide who has jurisdiction over our lives - a foreign corporation or our state and federal laws? Yet the Trans Pacific Partnership (pushed by newly re-elected Mr. 10.5 percent*) will probably pass in the lame duck session. What human wants more fossil fuel development as our planet burns to a cinder? Yet the Obama administration is poised to approve new Gulf oil leases. The list is endless as anyone with an email address knows. * Ron Kind got about 81 percent of the votes of the 13 percent of voters who showed up on August 9. So, about 89.5 percent of voters did not vote for Ron Kind. We all know he was right. One of the more tragic current examples of how American social movements continue to fall into this trap of civil obedience is how our anti-GMO organizations have responded to Monsanto Corporation’s proposed DARK Act, which bans states from requiring the labeling of GMO foods, and which our Congress, Senate, and President Obama all passed into law over these last few weeks, even though it was opposed by 90% of Americans. Because the DARK Act is now law, Vermont’s existing law that requires all foods containing GMOs to be labeled, has been struck down and can no longer be enforced. For years now, the Organic Consumers Association, Center for Food Safety, Food Democracy Now, and other national and state organizations, have been leading the American people down a path of civil obedience, consistently claiming that if they can just get more signatures on their online petitions, if they can just get another wave of donations from their millions of supporters, that they will continue to win against Monsanto Corporation and its allies. If that were actually true, the DARK Act would not have been passed by an overwhelming majority of both Democrats and Republicans, Obama would have vetoed it, and numerous states would have already successfully banned, not labeled, GMO foods. So clearly, something is terribly wrong with the strategy that these anti-GMO groups are asking us to follow. Is there a better alternative? Of course there is! Is anyone interested in hosting a screening of this film about the effect right wing media has had on our politics? Ever wonder how we ended up with Republican presidential nominee Donald Trump? Trump is a product of decades of hate and fear-mongering spread through right-wing media -- with Fox News leading the way. No film does a better job exploring the personal implications of this dangerous propaganda than "The Brainwashing of My Dad," which has received excellent reviews from critics and audiences alike. In "The Brainwashing of My Dad," filmmaker Jen Senko examines the rise of right-wing media through the lens of her father, whose immersion in it radicalized him and rocked the foundation of their family. She discovers this political phenomenon recurring in living rooms everywhere, and reveals the consequences conservative media has had on families and a nation. As Bernie Sanders and Elizabeth Warren know, it's not enough to just fight the hate of the right-wing media -- we need to offer an alternative vision for America. With less than a hundred days left until Election Day, Democracy for America is organizing "The Brainwashing of My Dad" watch parties across the country on September 15 as a unique opportunity for DFA members to get together, get organized, and get to work building the political revolution to defeat Donald Trump and change the Democratic Party in the critical years ahead. Will you host a viewing of the film "The Brainwashing of My Dad" for your family and friends -- and anyone else you want to invite -- on Thursday, September 15? YES! 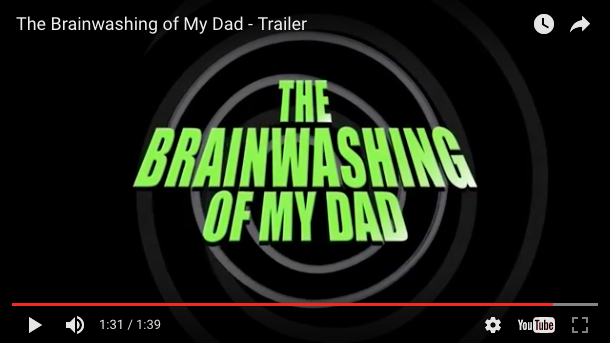 I'll watch a trailer for "The Brainwashing of My Dad" and sign up to host a watch party on September 15! No, I'm not able to host a watch party, but I can chip in $3 or more to support these grassroots events across America. Enjoy the trailer? Great. 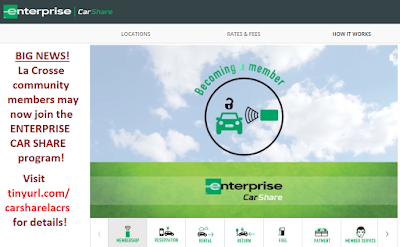 It's easy to get started as a watch party host! As a party host, all you’ll need to do is locate a comfortable place for your friends and family -- and fellow DFA members, if you want to use our event tools to invite them -- to watch this important film. We’ll provide materials and resources for all hosts, including a free DVD of "The Brainwashing of My Dad" (or you can stream it over the internet), helpful prep and planning calls for hosts, and an important strategy call with a VIP on September 15. Sign up now to host a watch party to experience "The Brainwashing of My Dad" -- it can be a small showing with just your family and friends or a larger gathering of people in your community who want to build the political revolution to defeat Donald Trump in November and change the Democratic Party in the months and years to come. YES! I'll watch the "Brainwashing of My Dad" trailer and sign up to host a watch party on September 15! Join our new facebook group! Local progressive politics, served fresh daily. You are invited to a special webinar/conference call on the new election law changes taking place this November in Wisconsin hosted by Citizen Action's own Anita Johnson. Anita has been featured in national articles for her years of work protecting the right to vote, and most recently for successfully joining the lawsuit that threw out many Wisconsin election restrictions. In the last few months, judges have thrown out, overruled and upheld numerous changes to Wisconsin election law - from Photo ID to weekend voting to residency requirements and more - and it has left many people unsure of the current state election laws in place for this November. We want to help. With the election less than 3 months away, you cannot afford to miss this important primer on the state of current Wisconsin election law! PS: Can't make this event? RSVP anyway to receive the details of election rules after the webinar! It’s been a little more than a year since we started reporting on La Crosse area efforts to elect Bernie Sanders as the Democratic party nominee for president. What a long strange trip it’s been, to quote the Grateful Dead. This is our last issue of La Crosse 4 Bernie News. Last Tuesday, about thirteen per cent of eligible voters turned out to give pro-TPP corporatist Ron Kind another term in Congress. Challenger, Myron Buchholz received about 18.7 per cent of the vote total (unofficially fewer than 41,000 votes total). We will try to keep information about local, regional, state, and national progressive events going at couleeprogressives.org. If you would like to blog there, please email Cathy. Tonight the La Crosse County Democratic Party is meeting at their HQ (117 Fifth Avenue South). Socializing begins at 6:30 and at 7 p.m. Ismael Ozanne, District Attorney of Dane County, will speak on recent Federal Court decisions on redistricting. Wednesday, August 17 – CNN Town Hall with GREEN PARTY candidate, Jill Stein. Streaming live on CNN and online (CNNgo). Some communities are hosting watch parties – is there one in La Crosse? I don’t know. Don’t expect to see any third party candidates in the “debates” either, since the Dem/Rep parties control who can get in. Wednesday, August 24 – Bernie Sanders live stream – OUR REVOLUTION kick off. The Vernon County Dems are hosting a watch party. Friday, August 26 – La Crosse City Clerk will offer TRAINING FOR SPECIAL (VOTER) REGISTRATION DEPUTIES at 10 a.m. in the 3rd floor conference room at City Hall. There will be more trainings in early fall, but this is the only one set so far. Please RSVP to lehrket@cityoflacrosse.org or call 608 789-7556 with questions. The League of Women Voters is seeking SRDs to help register students during move-in week at UWL If you are an SRD and available, please email Mary. Today is the day! We're never going to have such an opportunity to overturn the status quo, send Ron Kind to his next career, and get a real progressive in Congress. With no Republican running, TODAY IS THE DAY. If Myron wins today, he is in! And this year is the year because the Bernie backers are motivated to make a change. 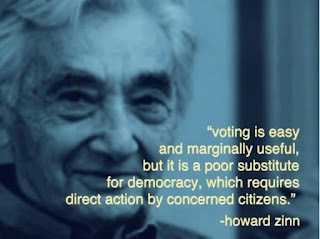 If you need more info about voting, check myvote.wi.gov. There will be an election party at BIG AL'S on Third Street in La Crosse starting at 7 p.m. tonight for everyone who has worked or voted for Myron. Bernie is inviting people to sign up to host an OUR REVOLUTION KICKOFF PARTY on August 24. If anyone is interested locally, please make sure to let us know. Please join us for one or more of these IMPORTANT PROGRESSIVE EVENTS this week! 1. 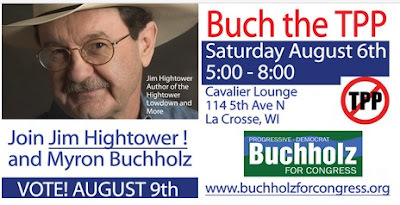 WEDNESDAY (5 to 6 at corner of Third and La Crosse Streets FRIDAY (5 to 6 at corner of Losey and La Crosse St) - WAVE SIGNS FOR MYRON BUCHHOLZ. Signs provided. Questions? Email JD.